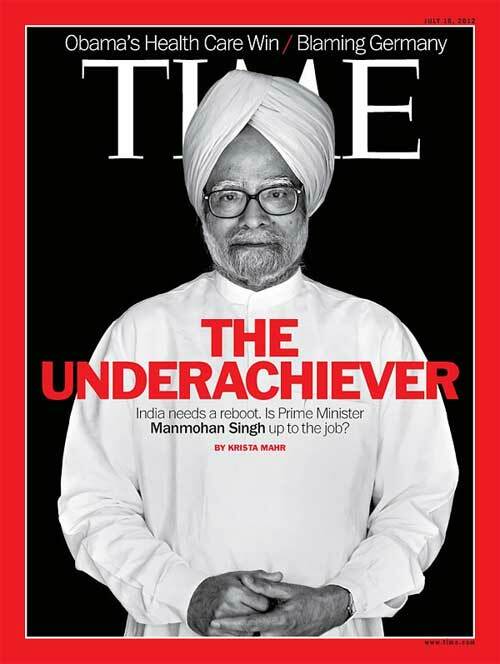 Time magazine has nailed the title of cover story “The Underachiever” on the Prime Minister of India.. Mr. Manmohan Singh. It is because of the political parties in India that we as the citizens have to face such embarrassment. Do add your comments below. « Sansani on Indian Television… Fake or Real? This entry was posted on Tuesday, July 10th, 2012 at 12:35 pm	and is filed under Cribbin. You can follow any responses to this entry through the RSS 2.0 feed. Both comments and pings are currently closed. It is unfortunate to note that when some body passes good advise in healthy spirit is seen negatively by we Indian.The slum dog millionaire was taken in good spirit by most of Indians.It is a shame that we beg foreigner’s appreciation in healthy or unhealthy spirit is immaterial. Dr Manmohan Singh,learned P.M.possess huge potential,he has not fully utilized his optimum latent potential for promoting the economic growth of the country.The time magazine expressed in terms of under achiever w.r.to his potential Dr Manmohan Singhji has.There is unnecessary hue and cry for changing the potential context. When Lok nayak Dr Jai Prakash Narain was ill, the nation was treating him for his kidney disease/ailments but when foreign Dr were called for their advise they diagnosed him for liver treatment in lieu of main kidney treatment.This you can attribute as ‘under achiever’ in terms of Indian medical fraternity.